Polydactyls have extra toes on all four paws or only on the back or front. A cat with six toes on a paw is most often referred to as a polydactyl, but these cats go by many other nicknames as well. Other monikers for these felines -- some of whom have seven toes on a paw -- include Hemingway cat, mitten cat, big-foot cat and cat with thumbs. The connection to writer Ernest Hemingway made the polydactyl cat famous. Hemingway wrote about his six-toed cats after a ship captain gave him a white polydactyl kitten whom Hemingway named Snowball. Today, Snowball's descendants continue to live at the Ernest Hemingway House and Museum in Key West, Florida. Many of the 40 to 50 cats who call the museum home have extra toes, and all are said to carry the genes of their six-toed ancestors. Cats with extra toes are not uncommon, but they are found in particularly high concentrations on the Eastern coast of the United States and in southwestern England. They are so common in the Boston area that some people refer to them as Boston thumb cats. 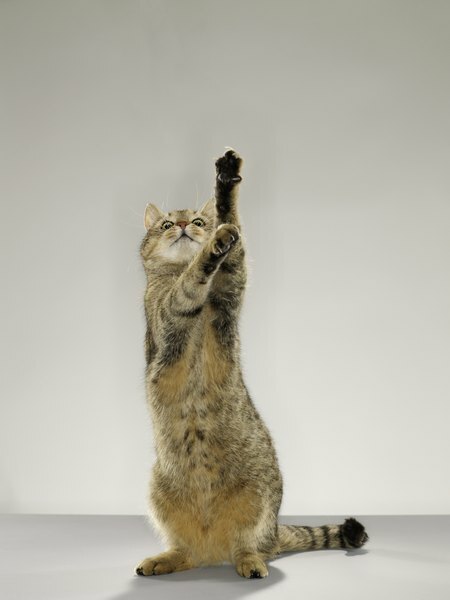 Another nickname, Cardi-cat, comes from the high concentration of six-toed cats around Cardiganshire in Wales. Polydactyl cats also are found in parts of Europe and Asia. Six-toed cats have a long history of being associated with ships. In Norway they are known as skipskatt, which means "ship cat." 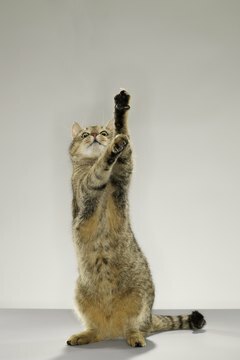 Sailors found six-toed cats to be better mousers than their kin with fewer digits, and they believed that they were particularly lucky to carry onboard. The association with shipping might explain the areas of the world that have particularly high concentrations of cats with extra toes. Polydactyl cats are said to be less common in parts of Europe where they were killed during witch trials. Cats with extra toes were considered more likely to have demonic connections. Many polydactyl cats are called names as normal as Kitty Kitty. They are regular domestic cats with a genetic mutation, not a specific breed. The extra toes rarely cause problems for the cats, and some people think the genetic mutation actually helps them. Some polydactyl cats are known to use their "thumbs" to grasp objects. Six-toed cats come in all color variations, and they can be longhair or shorthair. What Causes Cats to Prance? What Causes Cats to Have Extra Toes? Do Kittens Have Six Toes? How Rare Are Cats With Seven Toes?